Melissa Murphy, daughter of Louise Murphy and Shirley William Murphy. 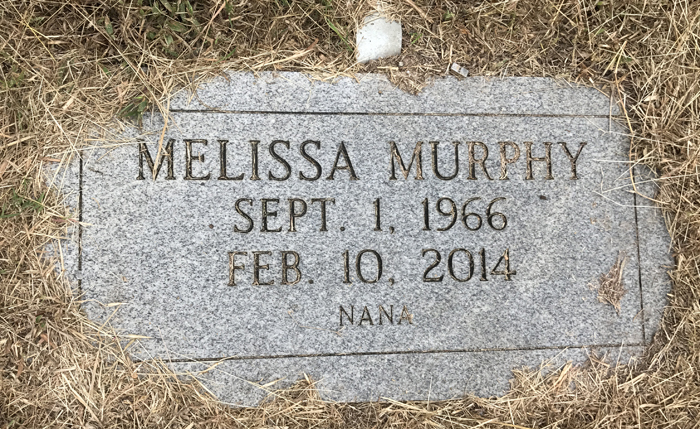 Melissa Ellen Murphy, age 47 of Jasper, passed away on February 10, 2014 at the Medical Center of Central Georgia. A graveside funeral service will be held on Saturday, February 15, 2014 at Old Macedonia Campground Cemetery at 11 AM. She is survived by Daughter; Amanda Jo Murphy of Calhoun, GA; Brothers; Jeffrey Murphy, Buchtel, OH, Shirley Murphy Jr., Plains, OH; Sisters; Brenda Samples of Talking Rock, GA, Virginia Murphy of Buford, GA; Grandchildren; Wesley and Samuel Murphy; several nieces and nephews. She is preceded in death by her Mother; Louise Murphy, Father; Shirley William Murphy, Sr., Brothers; Steve Barker and David Revels. Melissa Murphy, formerly of Athens, Ohio has lived in Georgia for the past 20 years. The Murphy family is accepting flowers at this time. The caring staff of Darby Funeral Home is in charge of these funeral arrangements.